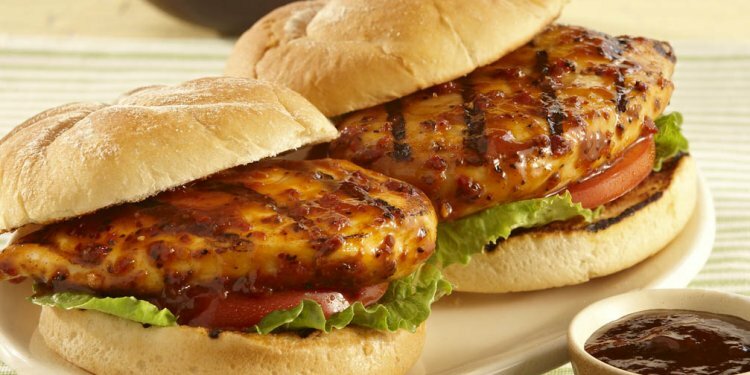 What to served with BBQ chicken Sandwiches? This is an unusual recipe on The Pioneer Woman Cooks, in that the detailed step-by-step photos don’t begin until halfway through the recipe. But I have a very valid reason for this! A very, very, very valid reason. And here it is. I didn’t start taking photos until halfway through the recipe. Anyway, that doesn’t take away from the fact that these sandwiches were out-of-this-world good. 1. Heat a little vegetable oil in a heavy ovenproof pot over medium-high heat. 2. Season a whole cut up chicken (I usually buy the chickens already cut into pieces) with salt and pepper. 3. Throw the chicken into the pot and sear it on all sides, trying to get the skin as brown (and to render as much fat) as possible. 4. Remove the chicken from the pot and set on a plate for a minute. 5. Carefully pour off excess fat and oil into a metal bowl. Discard the fat once it cools. 6. Return the pot to the heat and add 1 whole sliced onion and 8-12 whole cloves of garlic. Don’t chop the garlic! 7. Pour in a large bottle of your favorite barbecue sauce. 8. Return the chicken to the sauce and mix in the chicken until it’s all coated. 9. Place the lid on the pot and put it in a 300 degree oven for 1 1/2 hours or so, until the chicken is falling off the bone and the sauce is crazy flavorful and bubbly. And that’s where we are now! Basically, I seared the chicken, poured off the fat, sauteed onion and garlic, poured in barbecue sauce, submerged the chicken, and cooked it low and slow in the oven. Because of the lighting, this looks a little dark, but it was absolutely perfect. Lots of lovely caramelization going on. The first thing I did was remove the garlic cloves, which were still intact, and which were almost like candy at this point.